﻿ Even with Broken Machine failing to meet the expectations set by the debut, there’s still plenty of reasons to be excited for Nothing But Thieves’ live show. For one, they’ve rapidly risen to become one of modern Britrock’s standout success stories, particularly with their reputation for sheer power in a live setting, and selling out shows across this current run is enough to enough to suggest that the favour this band has won is here to stay. The same unfortunately can’t be said for Darlia (5) who plough through a groove of grunge-touched modern indie without a single deviation. It’s serviceable enough – Nathan Day’s rasp has a bit more personality than your average indie frontman, and Dear Diary is enough of a highlight – but there’s precious little that sticks beyond a couple of cosmetic affectations. Overall, Darlia’s presence feels more or less perfunctory within the scene as a whole, and for a band who were so hotly tipped not that long ago, that’s hardly a good thing. It certainly says a lot that July Talk (8) find them taking the higher spot on the bill, considering how they’re a significant improvement in every way. There’s genuine charisma and stage presence for a start, coming in the interactions between vocalists Peter Draimanis and Leah Fay, the former convulsing over his additional guitars and keyboards while dominating with his Nick Cave-style growl, while the latter utterly owns the stage with her hypnotic sways and just generally huge character. What’s more, the Canadians simply have far better songs, grounded in blues-rock and spikier indie-rock that traffics in the sort of thick bass grooves that are always entertaining. It just a generally excellent set overall, coasting on generally fiery personality and the sort of super-tight songs that really should get more credit. Any lesser band would have issues aplenty in attempting to follow it up, but as they’ve proved time and time again, Nothing But Thieves (8) know what they’re doing. Flanked by the angular, neon rigs that alone conjure a darker, seedier image than your typical indie bunch would ever try and establish, the Essex band’s fusion of classic rock ideals, indie polish and Conor Mason’s world beating vocals manage to carry a load far greater than the majority of their competition. It speaks volumes when even their weaker cuts are bumped up a few notches here; Live Like Animals and Broken Machine aren’t nearly as skeletal or underweight as their recorded counterparts, and Soda rids itself of a lot of the clumsiness that previously weighed it down so much. It’s not all good, though, and when the dip happens, it couldn’t be more noticeable. Mason’s solo cover of Tom Petty’s Free Falin’ does exactly as its title suggests for a crowd who really couldn’t care beyond the chorus, and Hell, Yeah takes a similar acoustic presentation that has little in the way of momentum. Beyond that though, there’s a real tightness that’s hard to miss, particularly in Mason’s incredible vocal dexterity that makes the seamless transition from record to stage. It hits a real peak during more languid cuts like Graveyard Whistling and If I Get High, but in truth, the malleability that Nothing But Thieves display is a consistent high point. Sure, there’s not a great deal of flow, but when the grimy textures of Hostage, the strutting alt-rock of Drawing Pins and a genuinely manic Ban All The Music are as individually impressive as they are, there’s not much to really complain about. It’s also incredibly handy when it comes to damage control; Sorry mightn’t be a stellar closer, and the decision to push Particles as a single over superior tracks and have it lead the encore feels a bit mismanaged, but there’s so much else on offer – more so than plenty of other bands are willing to offer – that any weaknesses feel severely diminished. As zeitgeist-y as they might ultimately be, Nothing But Thieves are a great band, and with the electrifying jolt of Amsterdam rounding off, that’s something that’s fully established. 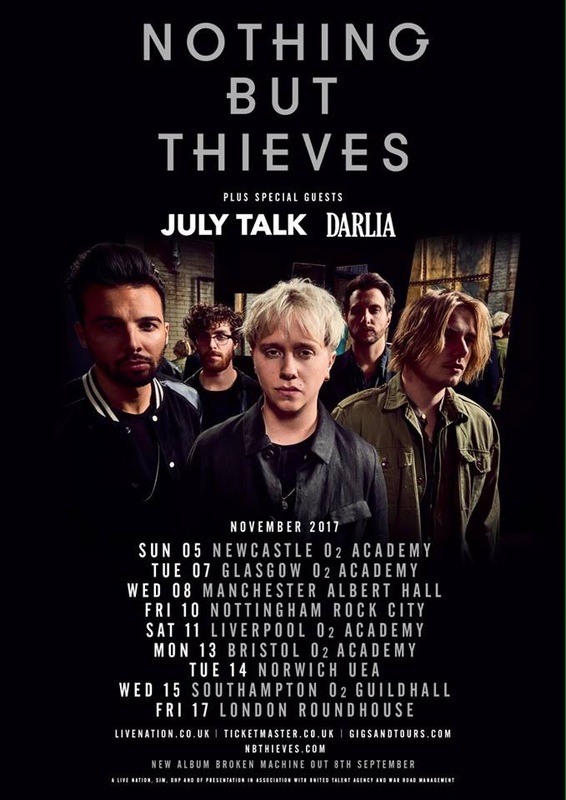 Even off the back of a considerably weaker album, Nothing But Thieves as a band are still running at full capacity.